Today I must share with you the story behind one of the most extraordinary critter encounters I have ever experienced (as also told on The Guardian Podcast (13:30-24:00) and The Blunt Report Podcast). “Giant cuttlefish,” I returned without hesitation. A few months ago, Spunky Abe and I had driven 15 hours to South Australia to observe the annual mating aggregation of thousands of these awe-inspiring creatures in the shallow waters of Whyalla. I was delighted to have come home to some unexpected sightings of the same animals at one of my favourite local dive sites. Within moments, Ruth had found not one seahorse but two nestled in amongst the bubble weed: a tiny male short head hippocampus with a large, pregnant belly, and a most unusual animal that either through birth defect, accident or run-in with a predator had no face whatsoever below its eyes. I wondered how the tiny creature could look so happy and healthy and how it kept itself alive without the usual long seahorse snout. How had it managed to sustain its life with such a dramatic disability? Enthralled by the chance to photograph these two distinctive seahorses separately and huddling together, I was surprised when Ruth tapped me on the shoulder and pointed to my left. The few cuttlefish I have seen previously at this dive site had been quite difficult to detect, camouflaging themselves as a rock near the base of a pylon or nestling in amongst the weeds, texturing and recolouring their skin to blend into the sea bed. But this normally elusive animal that I had wished for at the start of the dive now approached me boldly from behind, then swam around to the other side of the seahorses I was photographing, watching me intently. “Please come with me,” he whispered, and I followed without hesitation. We swam together for ten minutes, gliding side by side like old friends through the cold water, bathing in the bliss of the moment and the intensity of our unforeseen connection. Several times, the cuttle turned towards me, and sometimes he drew closer to my body as we swam together as though fearful that I might disappear. His eyes spoke volumes as they looked into mine, his unspoken words seemed filled with the most profound empathy. But why had this animal done the unthinkable, choosing and approaching me to swim with it along the pier pylons, then out across the sand to rest in the sanctuary of the seagrass? The tell-tale signs of the cuttle’s pale head, the withering tentacles gathered close into its body, the thread of decay unravelling upon its forehead and the small eruptions on its back revealed the terrible and wondrous truth. 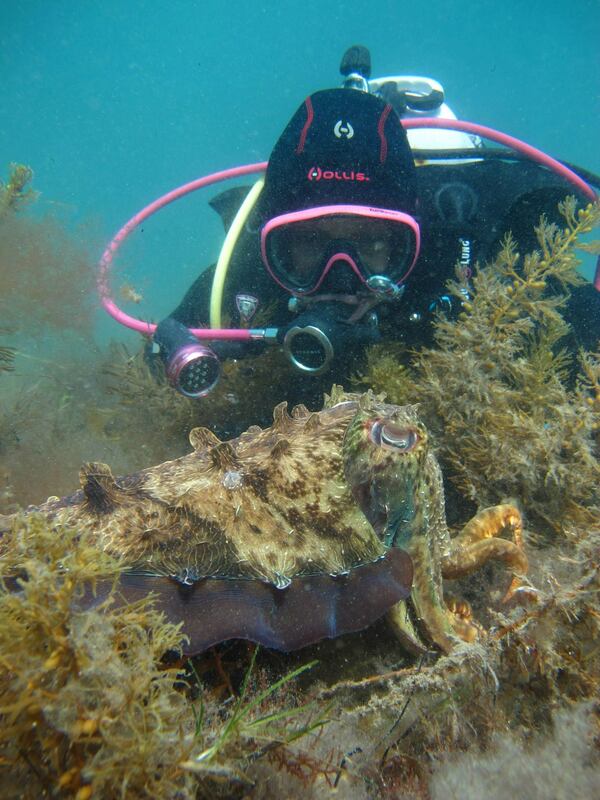 This gorgeous giant cuttlefish was dying. I had discovered on my recent expedition to the cuttle aggregation in Whyalla that after mating, the bodies of these majestic animals literally begin to disintegrate. And as they enter this final stage of their lives, they often seek the company of another animal that is also dying, staying in close proximity to provide each other with comfort and protection. I had spent much time in Whyalla filming and photographing one particular pair of cuttles in their waning hours, waiting for the inevitable end to come for them both. Only a week ago, my buddy LP and I had come across the sorrowful carcass of a giant cuttlefish floating on the surface as we entered the water of the same pier I was diving today. We knew from the extensive disintegration that it had recently mated, and that its mate would soon meet the same fate if it had not done so already. And yet the question remained. Why had today’s cuttlefish, a creature that would not normally seek out human company, appeared from nowhere behind me and invited me to accompany it for such a peaceful and seemingly purposeful swim? My buddy Ruth had followed us, and several times I had signalled to her to move closer to the animal to take photos. But each time the cuttle would move closer to me as though somehow we were uniquely connected, as though I would understand my role to be its protector. This giant cuttlefish could not possibly have known that one year ago my oncologist had given me a prognosis of six to twelve months to live. There is no way it could have understood that I too had faced the slow deterioration of my own body and been forced to accept the inevitability of death. And while it had chosen me as its companion and protector during the final stage of its life, my focus as we swam together was not on death at all but on the absolute bliss of the exquisite, unparalleled here and now. How utterly joyous to glide beside this creature, both of us still vibrantly alive in the face of impending death. “Come rest with me in the sea grass,” he whispered, nestling down as the texture of his back utterly transformed to hide in amongst the weed, wondering why I did not camouflage myself the same way. “Please stay with me until death comes for us both.” And the heart within me was wrenched by the choice – to stay beside my precious new friend until the last breath of air had been consumed from my tank and we slowly dissolved together? Or to follow my buddy Ruth back into the shallows, across the shore and back into a life of every moment lived as though death might never come. “Stay with me,” the cuttlefish implored, and for just a few moments I allowed Ruth to swim alone in the opposite direction, leaving me alone with the dying cuttlefish. “I can’t,” I sighed wistfully, consumed by revelation. “No matter what the doctors may have said, this is not my time.” But I promised to keep my companion alive in my memory for as long as I have breath. Reluctantly, I left the cuttle who had chosen me to stay with him until death, seeing Ruth safely back to the shallows where countless days of life await my resolve to live them to the full. No, my dear friend, I am not you today. I am more like the feisty little seahorse missing its snout, determined to survive against all odds. I’ve heard it said that time spent underwater is not held against the time you have left on land, so lately I’ve been following my doctors’ orders to the fullest extent and doing what makes me feel most alive. I like to think that I have many more dives in me yet, but when my time does eventually come, this one will sparkle in my memory more brightly than most. This entry was posted in Photos, Videos and tagged adventure, Australia, cancer, cuttlefish, death, dive, endometrial cancer, freshly pressed, health, life, marine, Melbourne, mortality, nature, ocean, photography, pink tank scuba, pt hirschfield, reddit, scuba, scuba diving, seahorse, sickness, underwater, video. Bookmark the permalink. Your post may be the best I have ever read on your site or any other diving or photo site. The thoughts and emotion you have portrayed, the poignancy of your words all make for an amazing read. Thank you for such a beautiful posting. Coincidentally, only minutes ago I too posted a small story and a couple of photos of my recent “cuddlefish” encounter. Not so thoughtful as yours but they are special just as you are. Keep the posts coming. PT: That sounds like a great dive. Getting the chance to just “be” with those creatures is a great treat. I’m very glad you’re beating your doctors’ estimates. Keep diving and winding the clock backwards! Best wishes, and thanks for sharing your journey with us! Lovely post. The cuttlefish was lucky to have found you, if even for just a while. Oh what a beautiful experience! I’m so glad you’re blogging your dive log! A wonderful experience, and beautifully described. 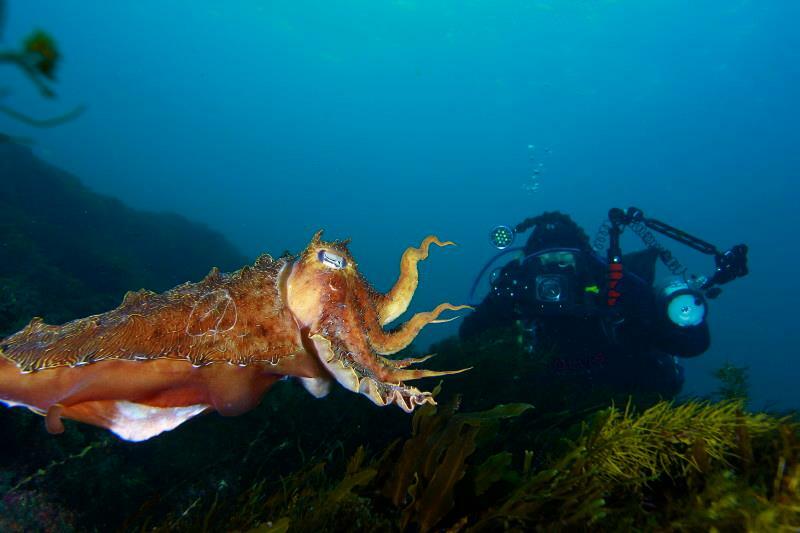 Cephalopods are the most amazing group of animals underwater. The intelligence and resilience they demonstrate puts many humans to shame, and if only we could read their minds. I wrote and posted about my love for Cephalopoda and your post illustrates perfectly how remarkable these lovely animals are. I wish you many years of inter-action with our mutual friends. I hope you will see many more cuttlefish’s lifecycles before it is time. Ruth’s reply: Not sure I know any if those people. I don’t know of any of our family that came to Australia before me. I’ll ask my parents to be sure.